Barcelona's 2-0 win over Inter Milan left them on the brink of a spot in the Champions League last 16. 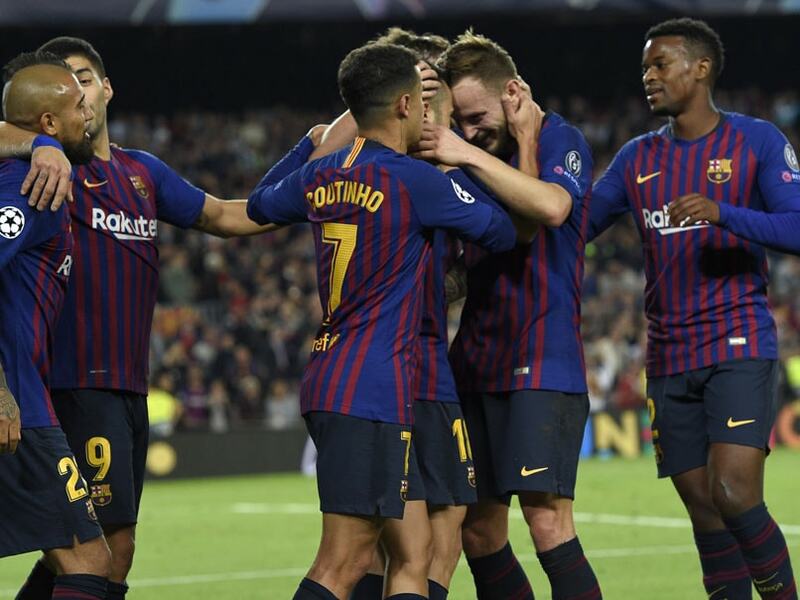 Barcelona overcame the absence of an injured Lionel Messi to defeat Inter Milan 2-0 in the Champions League on Wednesday, while Borussia Dortmund signalled their intent with a 4-0 demolition of Atletico Madrid. Barca collected a third win from three Group B outings as Rafinha, filling in for Messi after the Argentine star fractured his arm at the weekend, volleyed in the opener on 32 minutes at Camp Nou. Philippe Coutinho rattled the crossbar in the second half before Jordi Alba sealed the points seven minutes from time to leave Barca on the brink of a spot in the last 16. "We needed to step up given the absence of Leo," Ernesto Valverde said. "It was in the head of us all." "We have a certain style, then Messi gives us a touch of brilliance that is extraordinary. When he is not there we have to supply it in some other way," he added. Bundesliga leaders Dortmund, who were missing in-form striker Paco Alcacer, delivered the performance of the evening as they handed last season's Europa League winners Atletico their heaviest defeat under Diego Simeone. Dortmund top Group A with a maximum nine points, although Atletico still remain favourites to progress alongside them after Thierry Henry's Monaco and Club Brugge drew 1-1 in the other game. Moussa Sylla raised hopes of Monaco ending an 11-match winless streak by opening the scoring just after the half-hour mark in Belgium, but Wesley struck for Brugge to secure a point. "We are a little less negative than at Strasbourg," said Henry, after a defeat by Strasbourg in his coaching bow on Saturday. "But a draw is a draw, it's not a victory."